With the kids being grown and out of town, the fridge is packed with leftovers, leftovers, and more leftovers. I just can't figure out how to cook for just two people! Now, I am learning the art of cooking with leftovers and getting pretty good at creating the new from the old. I deep fried an 11 lb turkey and had after two or three meals, a whole breast left. Oh no turkey again??? The answer was Turkey Pot Pie. I used the chicken pot pie recipe on the back of a Bisquick box... creative cooking is the best. Preheat oven to 400. In a two quart casserole combine turkey, vegetables, and soup. Season with salt, pepper and a few shakes of dill. Mix well. In a separate bowl combine baking mix, egg, and milk. Mix with a fork or whisk until blended well. Pour over turkey mixture. Bake for 30 minutes or until crust is golden brown. 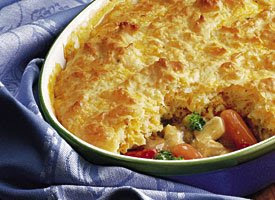 Hubby doesn't like pot pie but thought this one was really good. I cut the turkey chunks big to match the vegetables. It made quite a hearty pot pie and all the difference to the mister.